Tunnels – pie in the face anyone? Tokyo based comedy duo Tunnels can now claim to be the undisputed masters of tired old jokes after taking out the Seriously Lame Comedy Award for the third year running. This year`s field was perhaps the most competitive ever, as just about every comedy act in Japan was considered a possible winner. 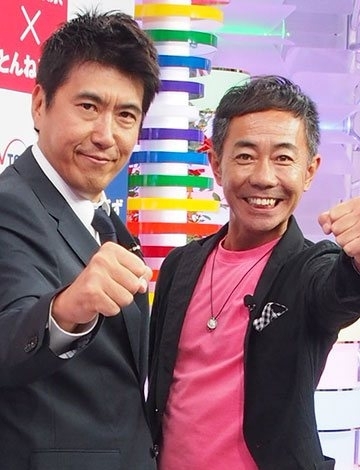 Takaaki Ishibashi (the tall one) and the other guy (the one who isn`t Ishibashi) were all smiles on receiving the award. Tunnels have found that a large part of their fan-base is among people possessing the most basic sense of humor, as well as people with too much time on their hands. Beginning their careers in 1980, they have enjoyed success over a long period, although the success has been barely deserved. The pair also received a book award last year for their handbook on the secret of their success, “How to consistently show contempt for the viewing public and make money”.